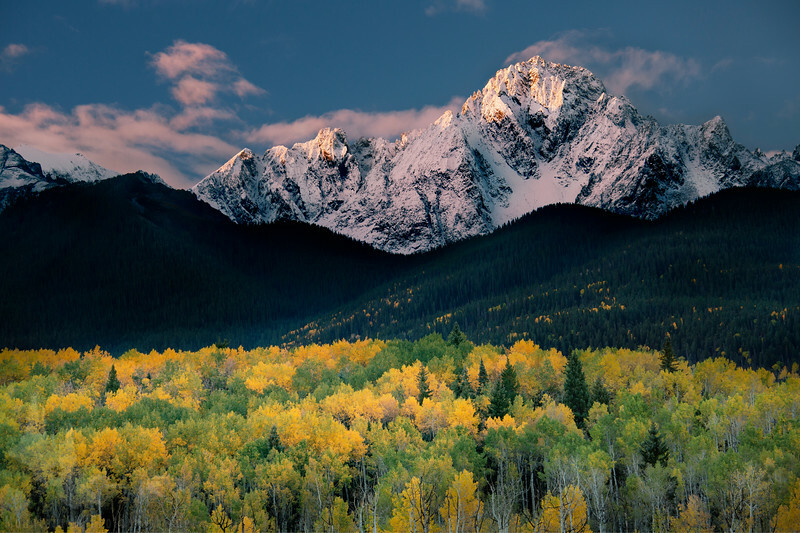 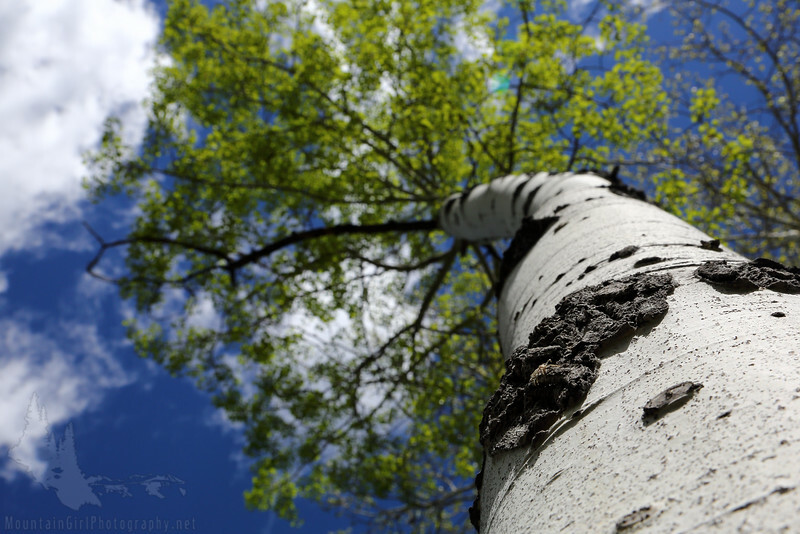 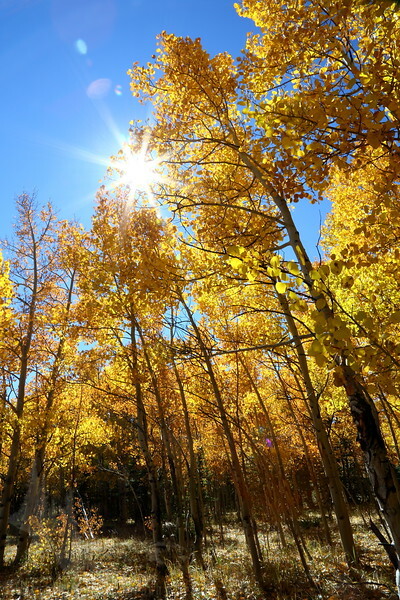 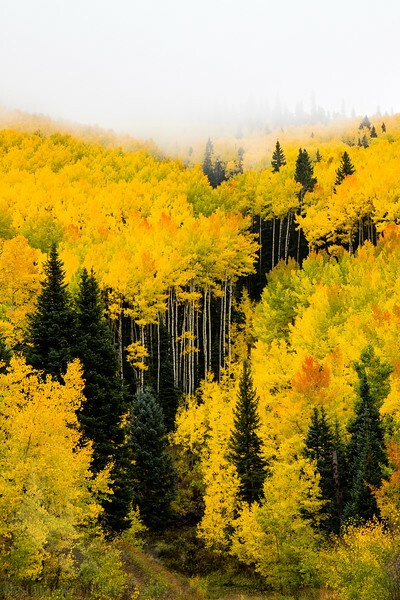 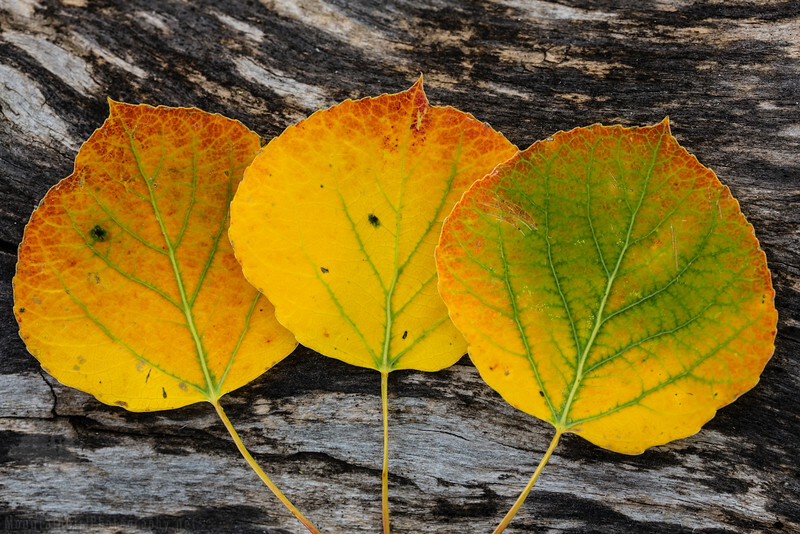 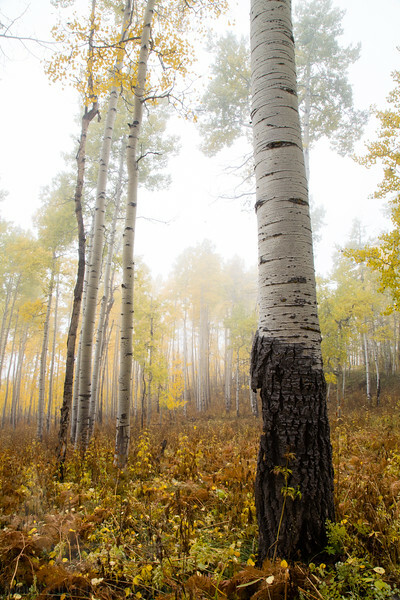 A whole gallery dedicated to aspen trees in the mountains, whether they be in the early spring green clothing or the brilliant colors of fall. 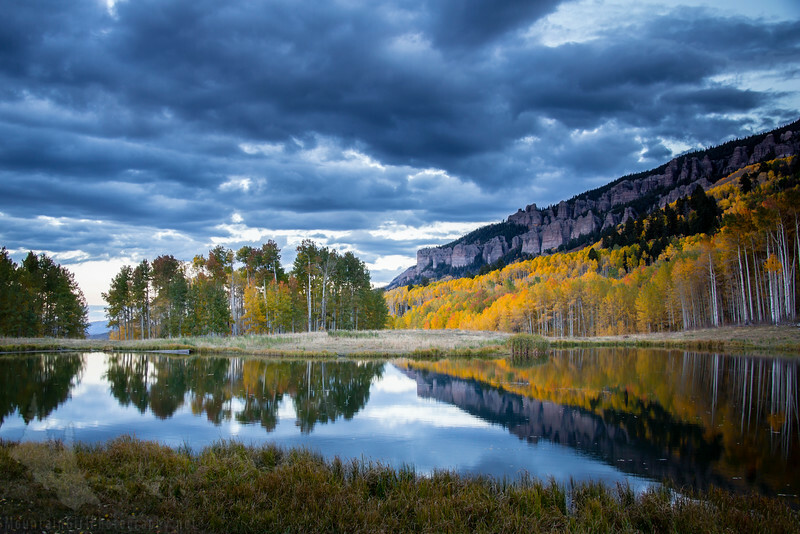 The stillness of the evening rests on a high mountain lake with the many colors of changing leaves on its flanks. 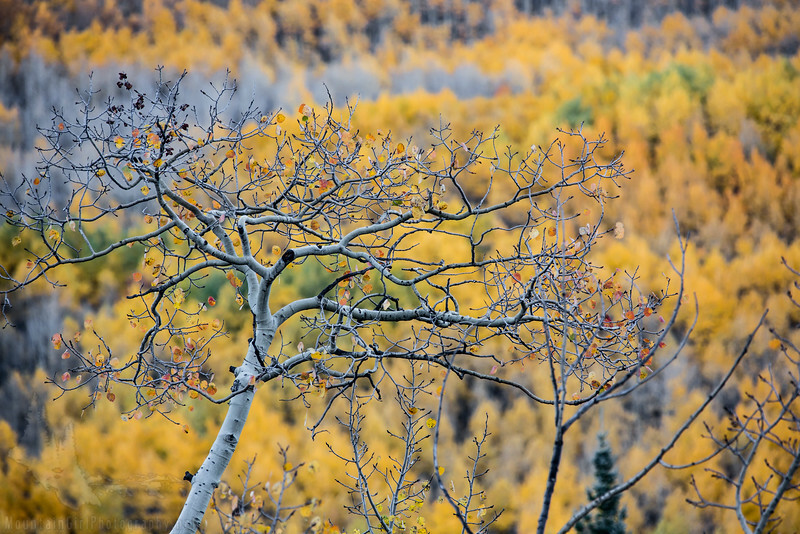 Twisted limbs reach toward the colorful ridge filled with aspens on Kenosha Pass. 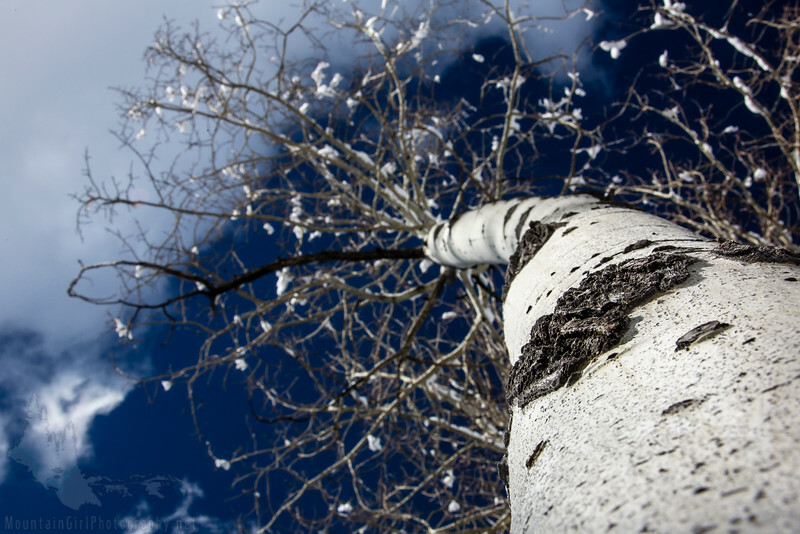 Snow clings to the branches of the same aspen tree featured in other seasonal images. 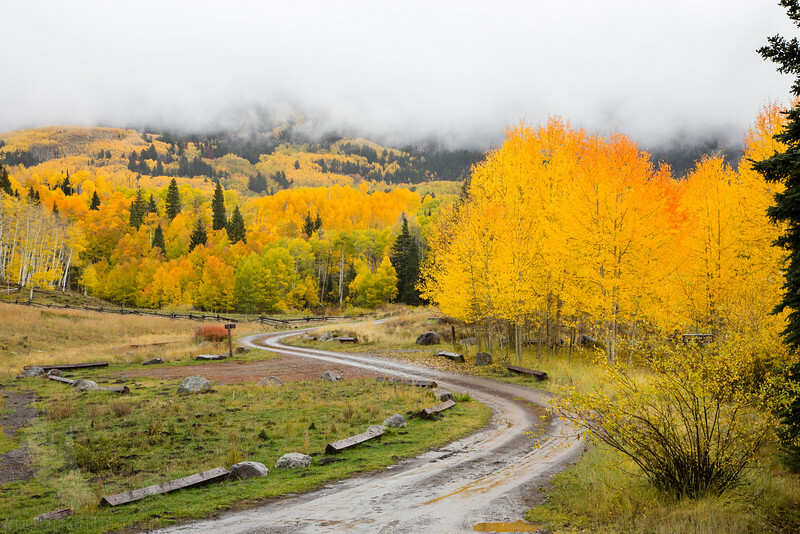 Meyer Ranch, Aspen Park, Colorado. 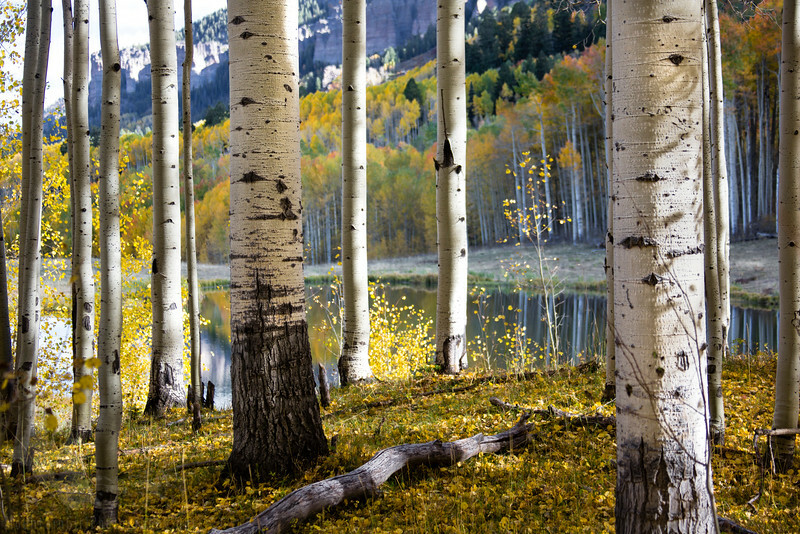 Drifts of aspen leaves float along the banks of a high Rocky Mountain Lake in the fall. 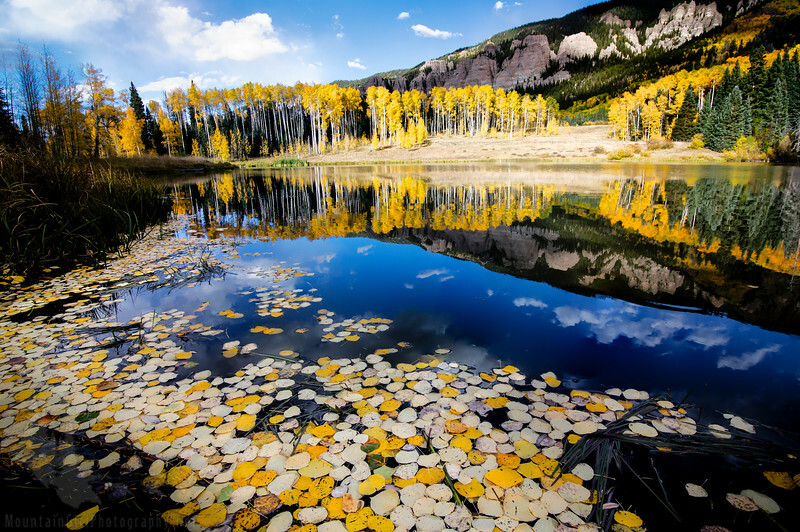 The reflection of the deep blue Colorado sky provides the perfect contrast for the golden leaves. 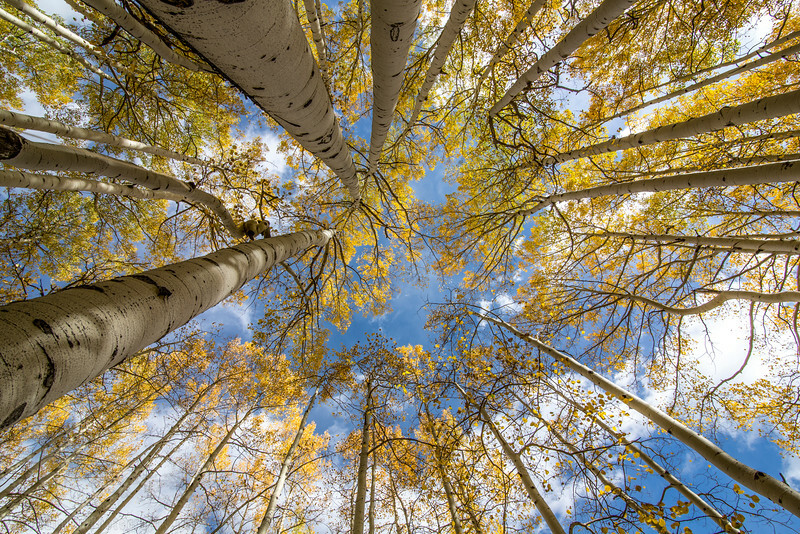 This image was recognized as a semi-finalist in the Denver Audubon Society's 2015 "Share the View" international photo competition. 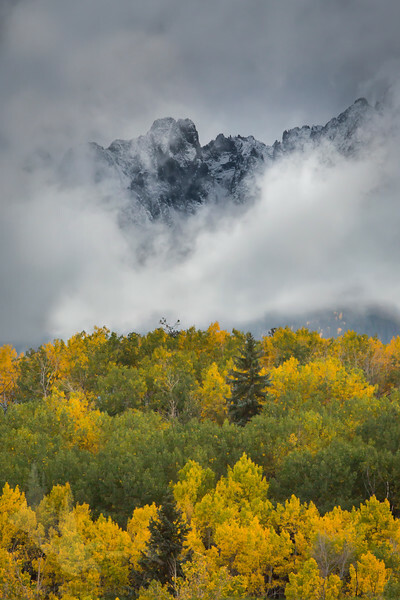 It was also published as the cover of the 2017 Denver Metro Area Christian Resource Guide. 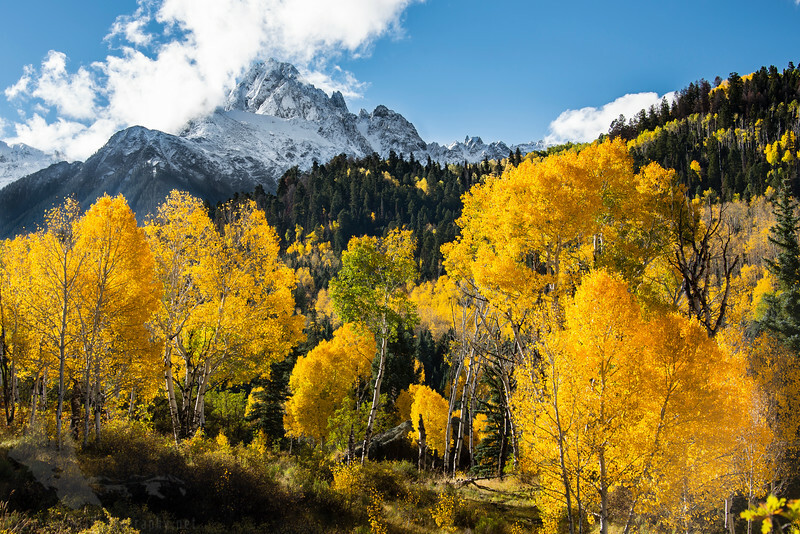 While I love grand scenes with mountains and snow, they would be nothing without millions--no, trillions--of these brilliant stars of the show. 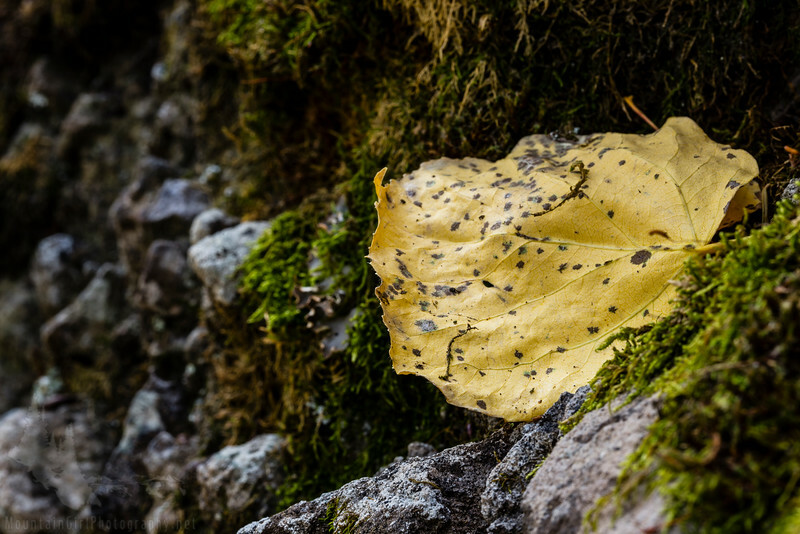 Perhaps that is why I so enjoy stepping into the forest and slowing down to see the small details just as much as I enjoy standing at an overlook. 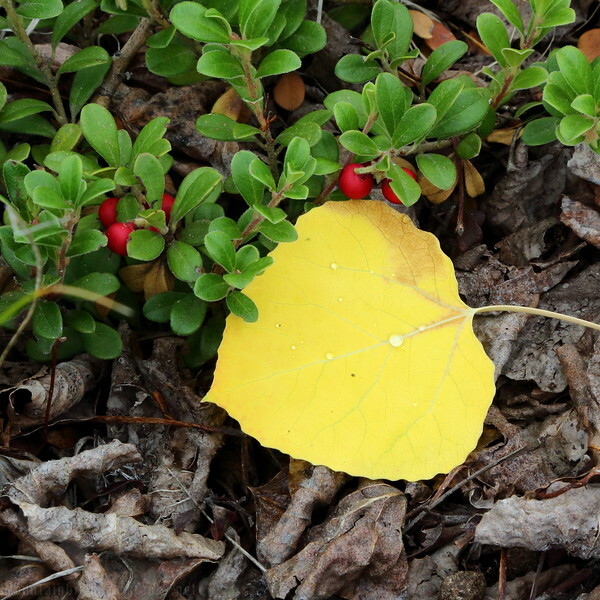 There is grandeur even in the tiniest of details. 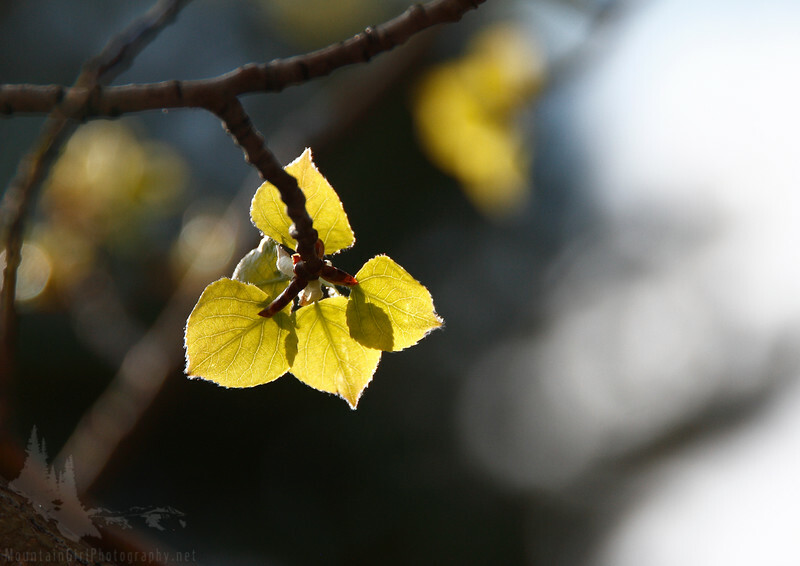 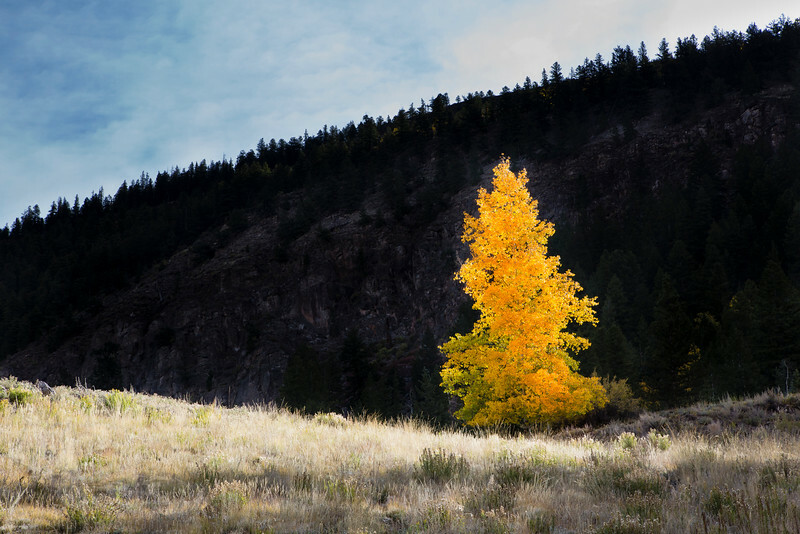 One tree, standing in the light. 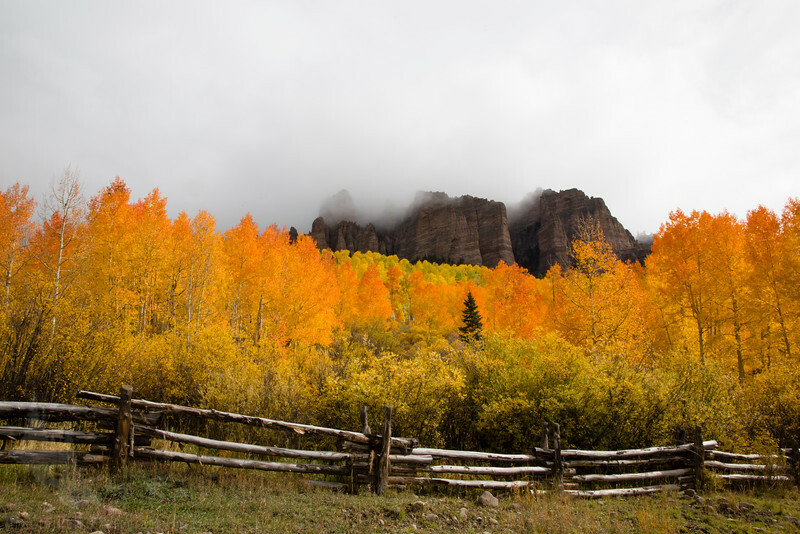 Aspens seem to flow down the valley looking up the Cimarron river valley on Owl Creek Pass. 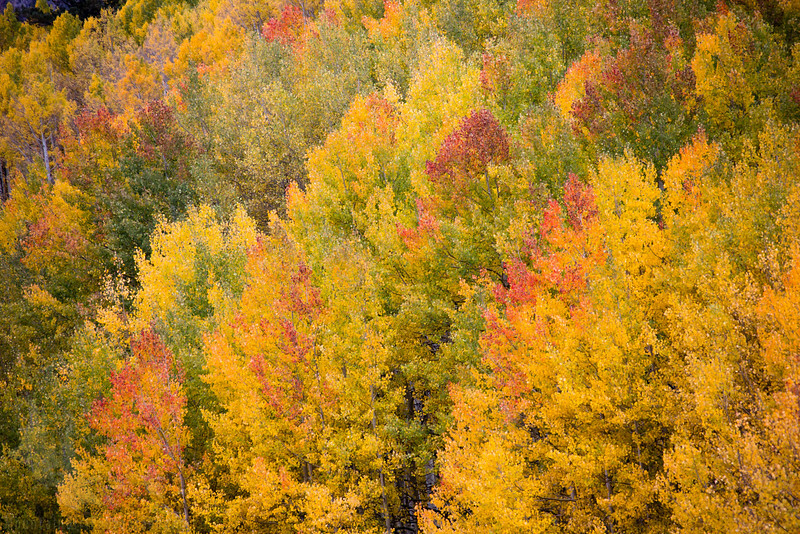 October 2014. 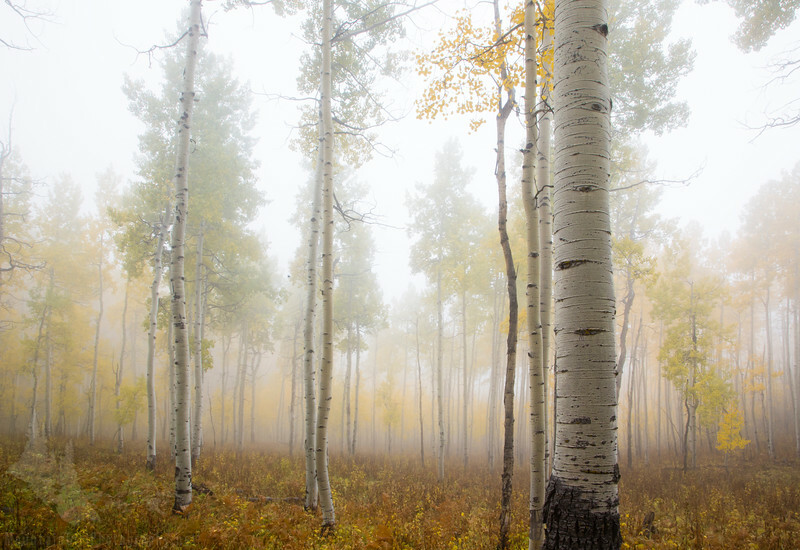 Golden and red aspens leave a narrow void over a small gulley as it twists up the mountain into the thick fog. 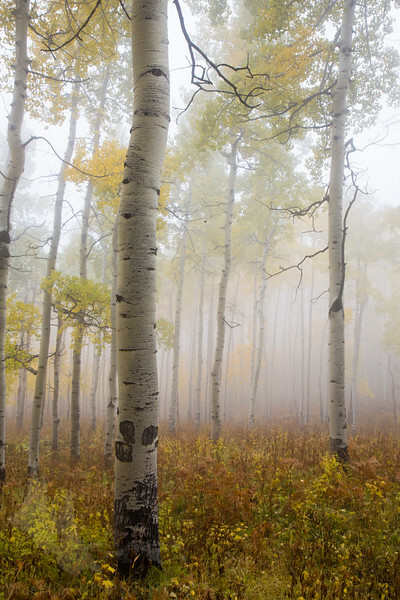 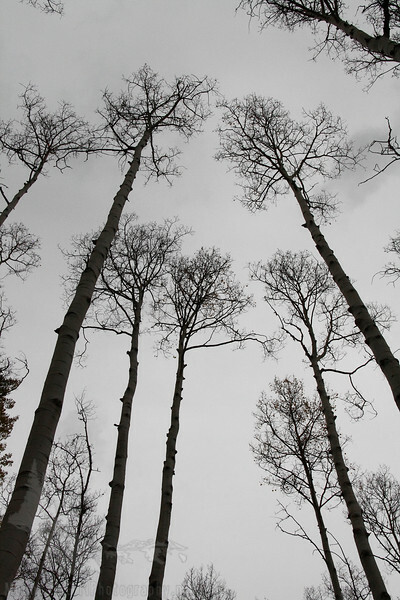 Taken on Owl Creek Pass October, 2014. 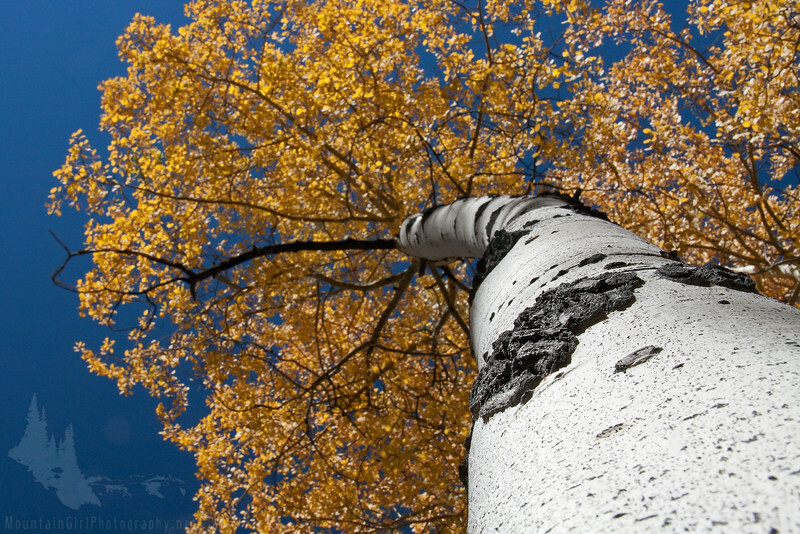 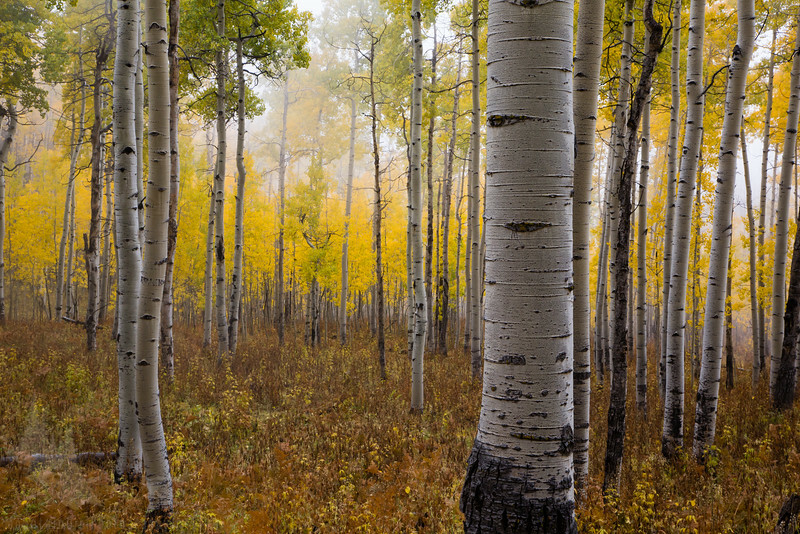 A wave of fall color sets the background for rows of crisp white aspen trunks on Kebler Pass. 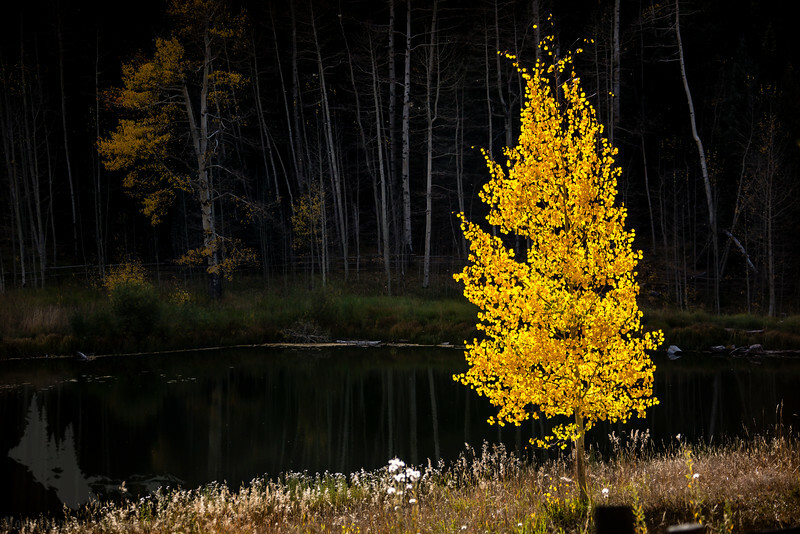 A lone aspen stands out against the dark background of an evergreen-covered ridge at Lake San Cristobal, CO. October 2014. 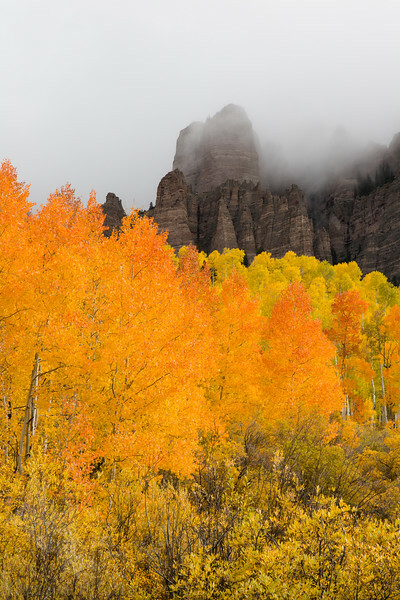 The High Mesa Pinnacles peek out from the fog above drifts of brilliantly colored aspens. 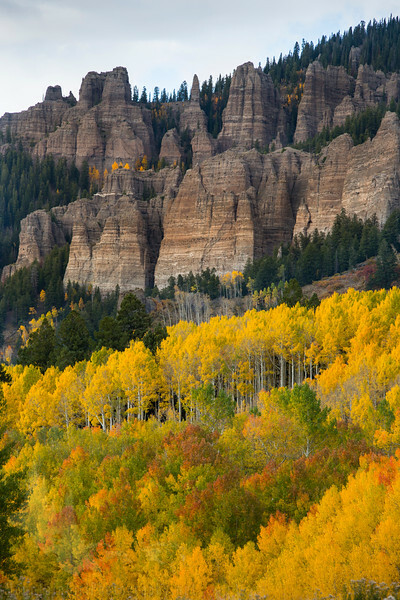 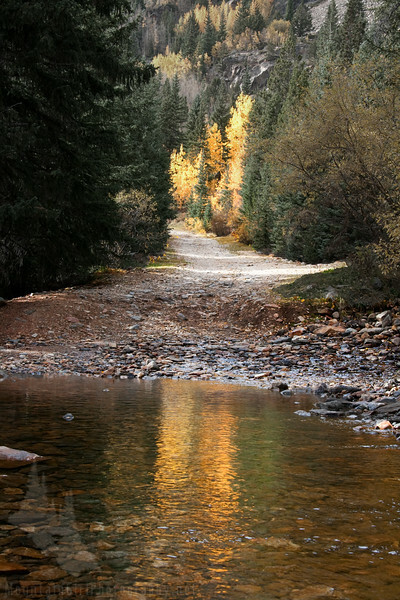 Owl Creek Pass, October 2014. 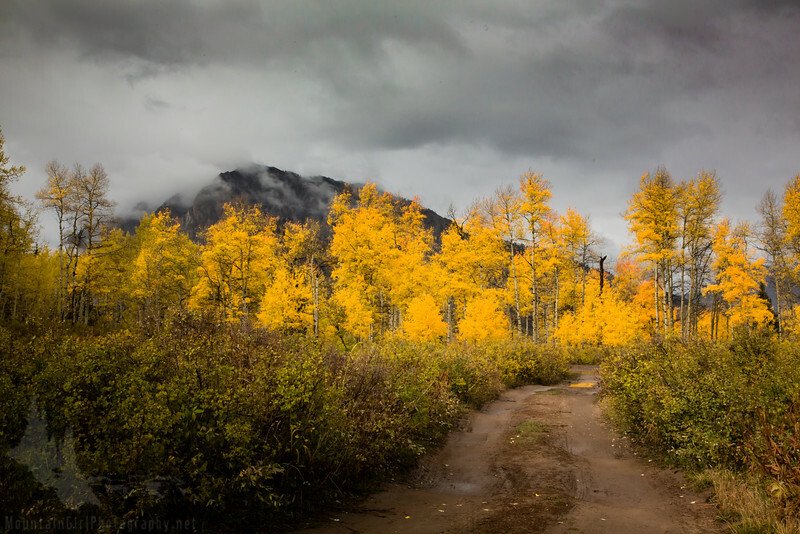 A muddy mountain road winds through aspens at their peak of color. 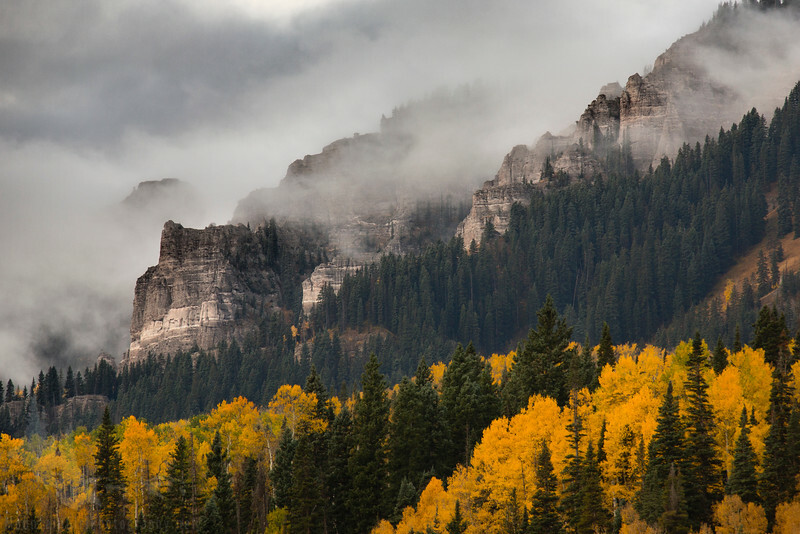 Taken on Owl Creek Pass, Colorado. 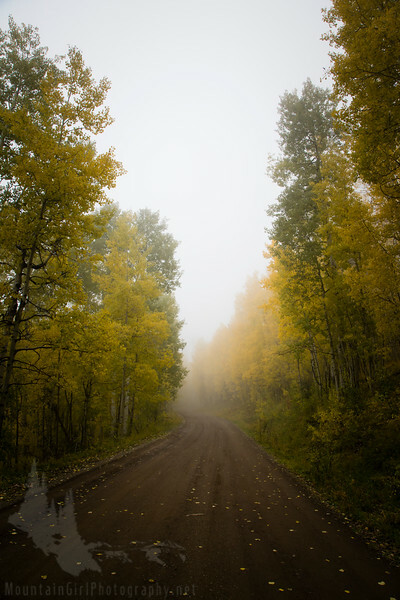 The road disappears around a corner into heavy fog on Owl Creek Pass near Ridgeway, CO.
A two-track road courses toward a bank of beautiful aspens in full fall color with Marcellina Mountain in the fog beyond the trees. 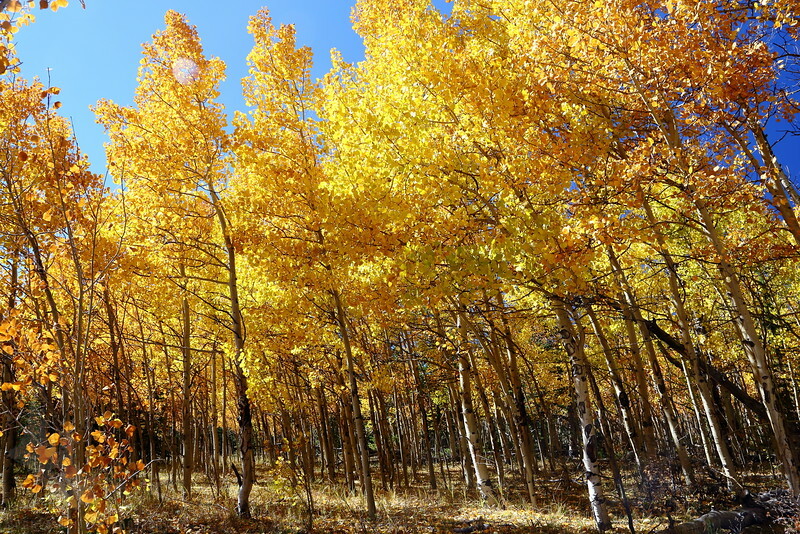 The aspens begin to turn in Hall Valley, fall 2014. 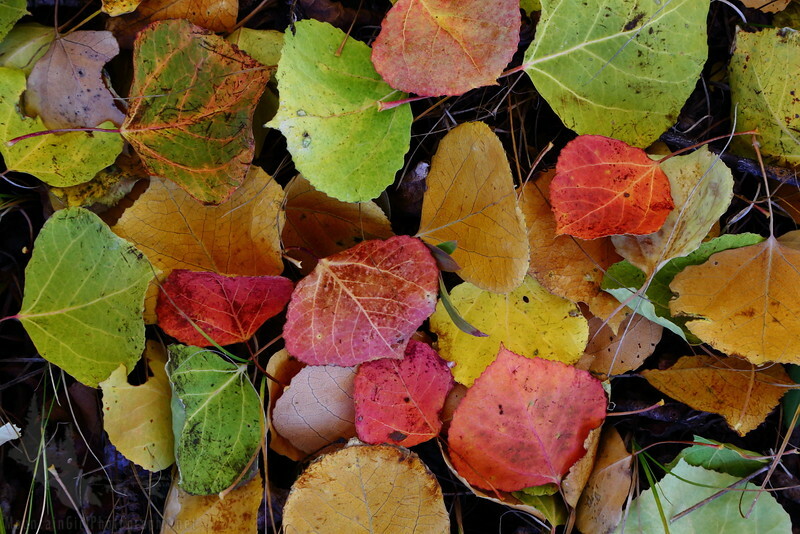 Multi-color aspen leaves litter the ground in a beautiful display. 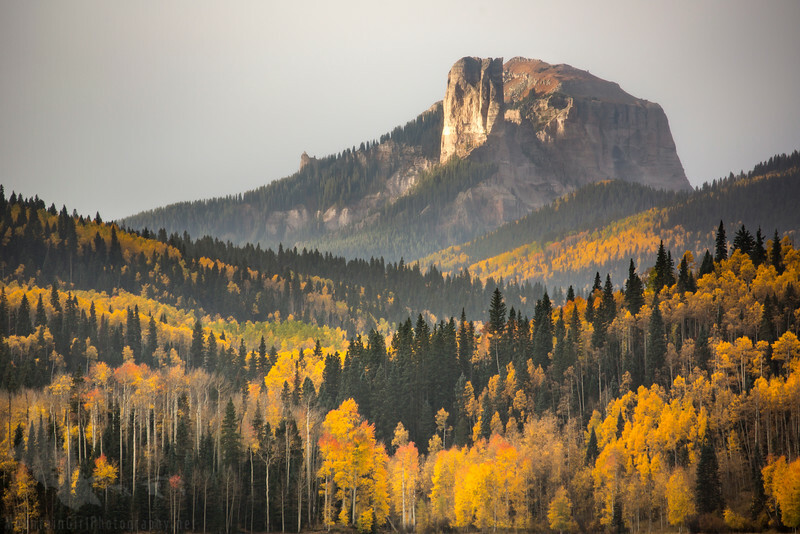 Taken on Weston Pass, near Fairplay, Colorado. 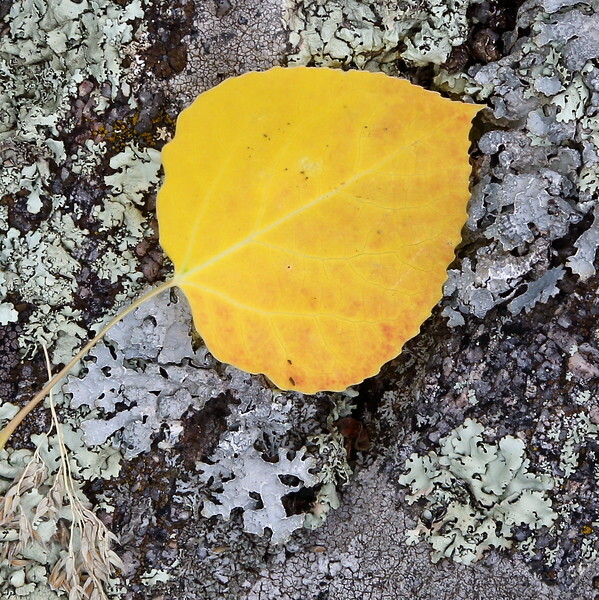 An aspen leaf rests where it fell on a lichen-covered rock at Meyer Ranch Park. 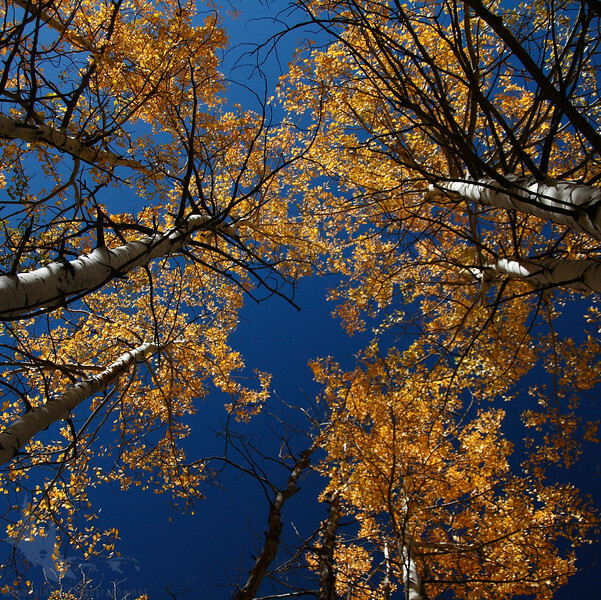 Conifer, CO.
Golden aspens reach toward the deep blue sky of Colorado in Meyer Ranch Park. 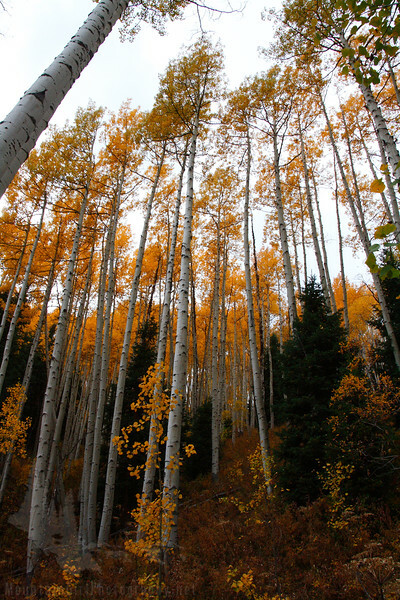 Aspen Park, CO.